Another tracker bites the dust. This time it’s Demonoid. 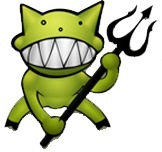 Demonoid was big, popular, and I’d bet Demonoid’s not going anywhere. The name might change, the server will absolutely change, but, as Wired says, "According to some reports, while the site is gone, the tracker appears to still be functioning and the downloading continues." And so the eternal struggle continues. How do you stop something that, for the most part, doesn’t tangibly exist? Whoever’s behind Demonoid has had their server shut down. All they need to do is find another server and continue where they left off. It’s not like raiding a warehouse down by the docks, arresting all the employees, and repossessing all the forklifts and office furniture. These shutdowns merely involve the displacement of code from one server to another. For authorities, it must seem like a frustrating game which has no end.